User Records are located in the 'Users' list in the 'Administration' subsection of the Accounting Module. Open the User Record of the User that will have the Report Role assigned and navigate to the 'User Roles' tab. User Report Roles are located in the section located to the right of the tab. Click the Report Role selector to view the list of available Report Roles. Select a Report Role, then click 'Add' to add the Report Role to the User Record. Multiple Report Roles can be assigned to a User Record. Report Roles are saved instantly. Click the trash icon next to an assigned role to remove it from the User Record. For User that will need access to 'All Reports', click the 'All Reports' toggle to bypass Report Roles and grant full access to 'My Reports'. The selection will be saved instantly. The Mass Role Update screen allows you to select a Report Role and see which Users have been assigned to that role, as well as quickly identify Users that do not have a Report Role assigned to their User Record. 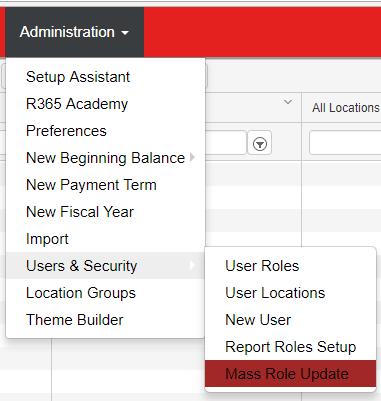 To access the Mass Role Update screen, hover over the 'Administration' menu in the top ribbon, then hover over the 'Users & Security' sub-menu and select 'Mass Role Update'. The Mass Role Update screen will load. Click on the 'Report Roles' Security Type to make Report Role updates. Use the 'Select Report Role' selector to load a Report Role. If the Role has Users assigned to the Report Role, they will appear in the section to the right. Click on the User to un-assign them from the selected Report Role. Additionally, any User that does not currently have a Report Role Assigned to their User Record will be listed in the left section. Click on any User in the left section to assign them to the selected Report Role. Any updates are saved instantly.